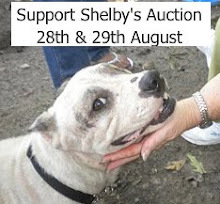 A 'Team Shelby' Fundraising Page: Thank you, thank you, THANK YOU!! Hi Everyone! JD and Max here with a huge, ginormous, humongous THANK YOU to everypup and their human who took part in the auction this weekend to raise funds for sweet Shelby's vet bills! "Thank you, thank you EVERYONE!!" Wow, wow, WOW!! We are blown away by the generosity of all you pups out there!! 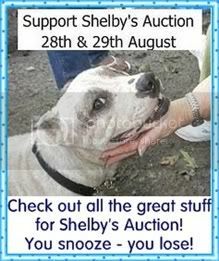 We know that sweet Shelby will really benefit from this! 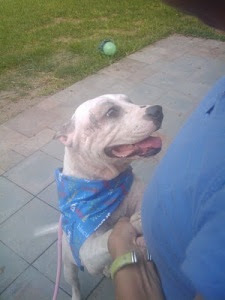 Just look at Shelby's smile - pawsome! We have listed the winning bids below. To pay for your item (or items!) please click here (or click on the 'donate' button on the right hand side of this page) to pay the amount due! Could we please ask that you click on the 'add special instructions to seller' and quote the TS number of your item(s) when you pay as this will help us keep track of payments - if we don't know the TS numbers when payments come in we'll struggle when we come to sending the items out! with the address of where you would like your item(s) shipped to so that we can let the 'seller' know where to send once we have confirmation that payment has come through! Please note that we will be announcing the winner of the 'Team Shelby Raffle' this evening - we're going to pick a name out of a hat! - so please come back to find out if you're the lucky winning pup! Thanks again for your bid - it will make such a difference! Click here to see if you're one of the winning bidders! If you are well done, don't forget to get in touch with us! That is just PAWESOME and INKHREDIBLE! Great job! You are absolute champs!!! Oh, boys! My momma got all leaky and I got all wiggly when we saw the total! I wish I had the words to tell you all how very much I luv you and everything you did to makes this pawsible. I wish I was there in pawson to gives you all a big snuggle and some wet kisses! My heart is just about to burst with happines! Thank you, thank you! It's lovely to know that sooooooo many dogs around the world care about Shelby. JD, Max and your intrepid assistant, you've done a wonderful job making this happen. WELL DONE! this is like the bestest news EVARRR!!! YAY FOR MISS SHELBY!!! and mega hooge thankies again to you dudes and your mama for makin' this aution happen!! Clare, thank you so much for all your hard work on behalf of Shelby. Also to JD & Max for their unwavering support. We are so thrilled that we were able to do a tiny part. You guys are totally, positively PAWSOME! I nominate you for the doggies of the MILLENIUM!